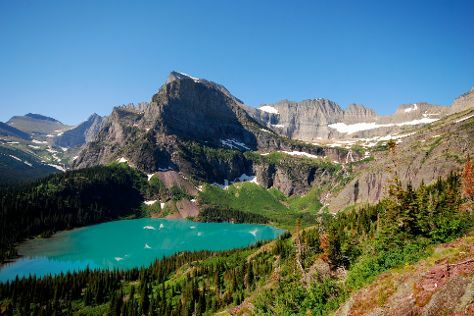 The glaciers from which Glacier National Park takes its name mostly dissipated eons ago, but they left behind a scoured landscape of high and steep mountain peaks, sparkling lakes, lush alpine meadows, and thick forests. Many visitors take all of this in along the 1,125 km (700 mi) of hiking trails or via the park's main road that traverses 80.5 km (50 mi) of wilderness. The park is home to white mountain goats, bighorn sheep, moose, elk, and rare grizzly bears and wolves. Bald eagles, golden eagles, peregrine falcons, and osprey roam the skies above, while westslope cutthroat trout, mountain whitefish, Kokanee salmon, northern pike, and Arctic grayling navigate the waterways. This diverse ecosystem serves as a mecca for hiking, biking, backcountry camping, cross-country skiing, boating, and fishing, making Glacier National Park an exciting attraction year-round. Glacier National Park is in Montana (MT). Plan your tour of Glacier National Park and United States travel itinerary using our United States online vacation builder .